Granting cartoon copyrights is being reiterated yet again in this post because copyright laws regarding cartoons is so important. More, now than ever because of electronic rights. Cyber laws and the Digital Millennium Copyright Act also come into the equation when cartoonists are requested to license their cartoons or illustrations. It’s important to know how you control the rights to intellectual property before granting someone else the right to use your cartoons – which includes reproducing, distributing, adapting, performing or displaying your cartoon work in any platform. By “platform”, I mean digital or hard copy (in print, such as newspapers, magazines, newsletters, books, posters, calendars, greeting cards etc.) professional publishing projects. Cartoon copyright infringement is very prevalent and does happen, hopefully this information here will help to embolden you and answer some questions to what is copyright law. You might also want to keep in mind if it’s even in your best interest to license or grant permission at all. By this, I mean charging a fee for that permission. After all, if you consider yourself a full time cartoonist or humorous illustrator shouldn’t you be charging a fee for your work? Of course, and this premise will resurface over and over due to the impact of the internet as it becomes the dominating factor in publishing. 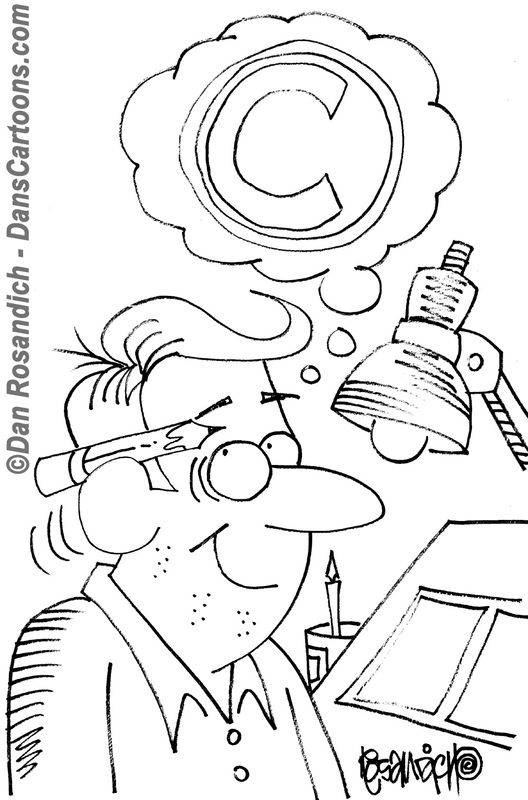 Getting your cartoons online and offering them through your digital portfolio or web cartoon catalog is imperative. It costs you a fee to register your domain name and renew it annually, there are costs incurred to have access to high speed broadband connectivity month after month, there are yearly web hosting costs to maintain your site and of course costs if you work with a designer to maintain all of it for you. Your licensing fees you charge for granting cartoon copyrights is very conducive to a justifiable fee to license cartoons to a client base. 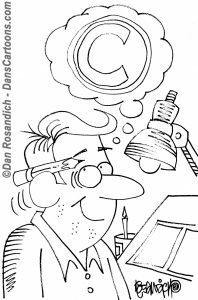 In follow up blog posts on this cartoon blog, I want to focus on specific topics that relate to granting cartoon copyrights and various steps you can take to ensure you are following a path that is ensuring the safety of your cartoon work that you make available! There are many variables involved such as granting electronic cartoon rights and ‘non exclusive rights’ and ‘exclusive rights’ and more. If you are asking yourself what is copyright infringement, I hope to provide you with additional follow-up information on copyright definition and more. Thanks for taking the time to stop by and watch for the follow up article to this one.